More than 500 participants gathered in Tunis last week for an international seminar on the prospects for prison reform in Tunisia. 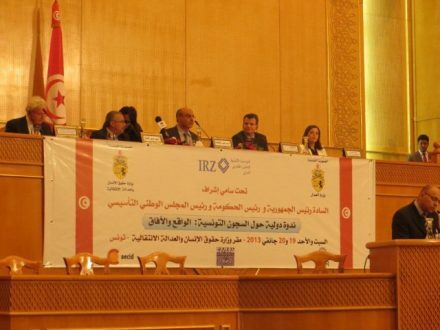 The event was hosted by the Tunisian Prime Minister, Hamadi Jebali, and Justice Minister Noureddine Beheiri, and was organised in collaboration with the Ministry of Justice, the Ministry of Human Rights and Transitional Justice, alongside the German Foundation for International Legal Cooperation, the Spanish Agency for International Cooperation for Development and the International Committee of the Red Cross. On Day 1 of the seminar experts from Tunisia, and from across the Middle East and Europe gave presentations on the reality of prisons in Tunisia; alternatives to imprisonment and the gap between legislation and practice; and on the experiences of participating countries like Spain, Germany, Switzerland, Jordan and Morocco. The second day saw a series of six workshops on a range of issues which hinder prison system reform. PRI’s Regional Director in the Middle East and North Africa, Taghreed Jaber, confirmed PRI’s commitment to working with the Ministry of Justice to reform the penal system in Tunisia: ‘This country was the pioneer of the Arab Spring and deserves to be leading reforms related to human rights and especially the rights of prisoners who have suffered the most over the years’, she said, as she affirmed PRI’s commitment to work with the Tunisian authorities and civil society to draft a national medium-term strategy to reform the Tunisian prison system. The Tunisian Minister for Human Rights and Transitional Justice said that for prison reform to succeed, everyone must be involved and that partnerships with both civil society and with international organisations were essential. Judge Mustafa Yahyaoui, Adviser to the Ministry of Justice and responsible for prison reform, confirmed that the Ministry would in the coming months set up a coordination committee for prisons to develop a strategy in cooperation with international organisations. Amending the penal system to include new alternative sanctions to imprisonment. Creating an accompanying body ‘to support judges implement alternative sanctions’. Increasing the public administration budget for prisons. Placing responsibility for health in prisons with the Ministry of Health. Supporting penal institution specialists such psychologists and social workers. Reviewing prison requirements for maintaining the physical and mental health of prisoners, in terms of ventilation, natural lighting, space, hygiene rules, and recreational activities. Establishing partnerships between prisons and other authorities such as the ministries of education and training, health and others. Establishing semi-open prisons to facilitate the reintegration of prisoners. Supporting the Social Fund for prisons. 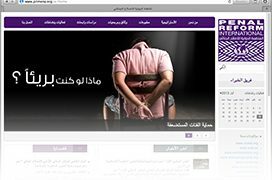 Strengthening the role of civil society and the media in rehabilitation and reintegration campaigns. Raising the educational level of prison staff. Strengthening the infrastructure of the National School of Prison Staff Training. Developing an appropriate framework to support rehabilitation and a vocational training system for the reintegration of prisoners. Revising the current prisoner classification system. Developing a legislative framework to motivate the public and private businesses to include the integration of prisoners into the workplace. Developing a national plan involving all stakeholders to address the high rate of recidivism.